Con artists love pretending to be from the federal government; it can lend an immediate air of far-reaching authority to whatever scam they are pulling. Similarly, play-acting as a tech support expert can take advantage of everyday folks’ lack of knowledge about the inner workings of their electronics. One Florida man allegedly tried to combine these two beloved character types into one Reese’s Peanut Butter Cup of fraud, only to be shut down by the very agency he impersonated. The Federal Trade Commission announced Tuesday that it had obtained a preliminary injunction barring a Florida man from operating a scheme that deceived consumers into believing he sold tech support services on behalf of, you guessed it, the Federal Trade Commission. According to the FTC’s complaint [PDF], beginning in July 2016 the man attempted to defraud consumers by claiming his companies — PC Guru Tech and Elite Tech Support — were hired by the FTC to sell tech support services and remove malicious software installed on their computers by another company. The man reached out to targets through unsolicited emails with the subject line “spyware was put on your computer.” The body of the email then claimed that the spyware was placed there by one of two technical support companies they had previously used, “Fast Fix 123” or “One Bit IT Co,” the complaint states. In order to give an air of authenticity, the emails included fake FTC press releases, the names of FTC staff, and claims that the tech support companies responsible for infecting the devices had been “shut down by the Federal Trade Commission,” according to the complaint. 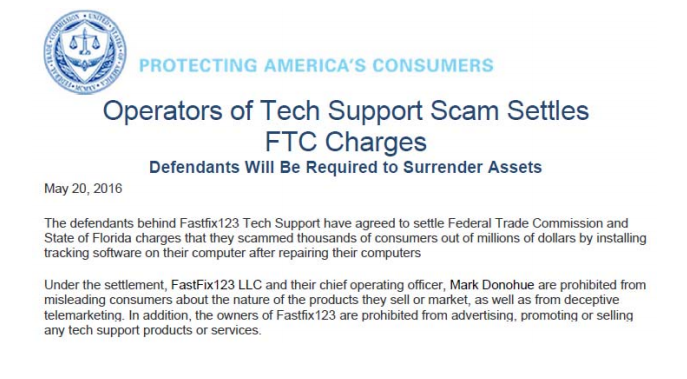 A fake FTC press release used by in the tech support scheme. The man also allegedly used scare tactics — such as claiming that consumers’ computers were sending out information to hackers — to convince targets to buy the unneeded tech support services. In reality, the FTC says it has never taken action against Fast Fix 123 or One Bit IT Co, and that it had not hired, authorized, or appointed the man to sell service on its behalf. The FTC claims that the man’s scheme violated the FTC Act and CAN SPAM Act. The agency seeks to permanently stop the alleged illegal activity. Previous Does The Fine Print In United’s Contract Prevent Kicked-Off Passenger From Suing Airline?